Having been to most BYOB’s in Collingswood at one time or another over the past few years, it’s a little surprising that Sapori slipped thru the cracks. In all honesty, for some time I thought it was a Japanese restaurant (not that there’s anything wrong with that). Anyway, last night, after some confusion on just how many we would have in our party, Carol and Joe B. joined my wife, Kathy, and I for a Saturday evening, pre-movie (Inception) dinner. Parking was easy for a change and we both had nice bottles of wine with us to enhance our meal. Joe’s contribution was the 2007 Ca di Rocchi Montere’ Ripasso, Valpolicella. Often referred to as a “baby amarone” this wine displayed ripe black cherries and a spicy pepper note with raisins lurking in the background. 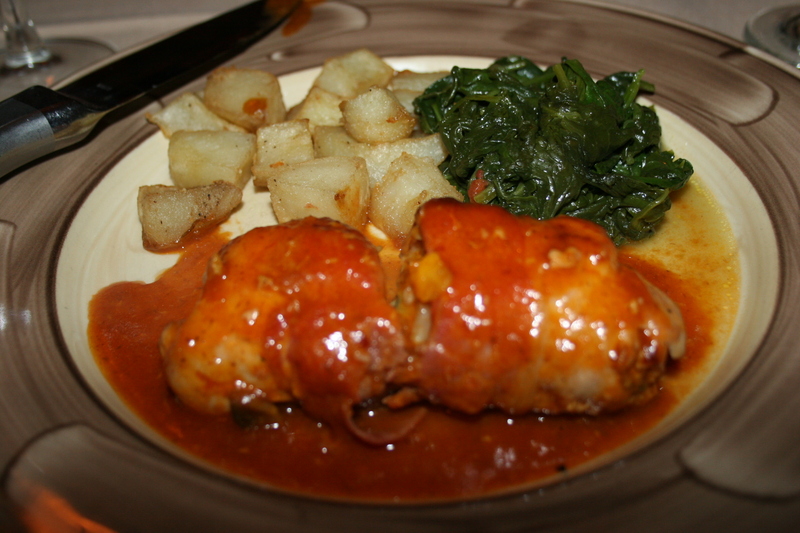 Joe said it was recommended by one of the staff at Hops n Grapes and I thought it went well with the rich red sauces. 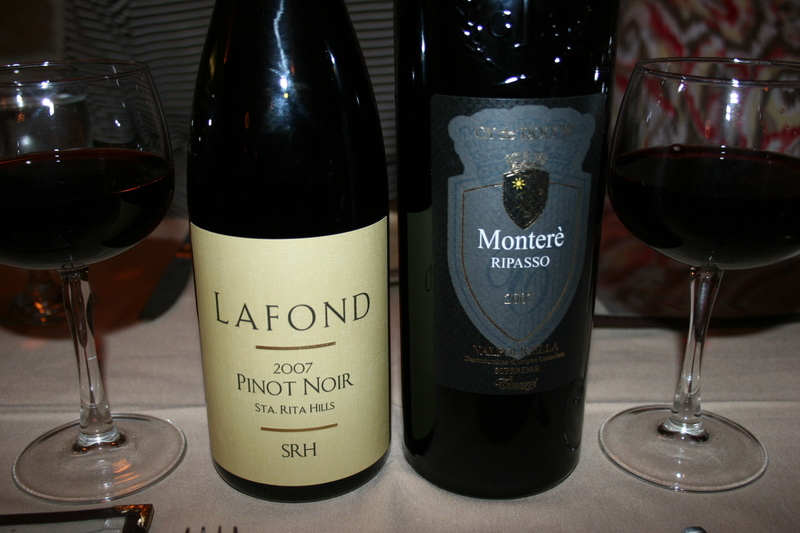 I had been thinking of having fish, maybe the Atlantic Salmon I read about on the web menu for Sapori, so I brought along a 2007 LaFond, Santa Rita Hills, Pinot Noir. The Lafond proved slightly darker than most Pinots with a vibrant nose of earth and flowers. Cherry cola and ripe berries gave this wine a smooth, flavorful taste that has me mentally adding it to my list of good Pinot Noir at reasonable prices. I believe this was just under or just over the $20.00 mark. Our server, Nick, who is actually a better looking guy than this photo would suggest, opened our wine and cooly and efficiently recited several “specials” from both the appetizer and the entree choices. As we chomped on some nice bread and a unique butternut squash/eggplant spread, he made some suggestions that were helpful in arriving at our selections. 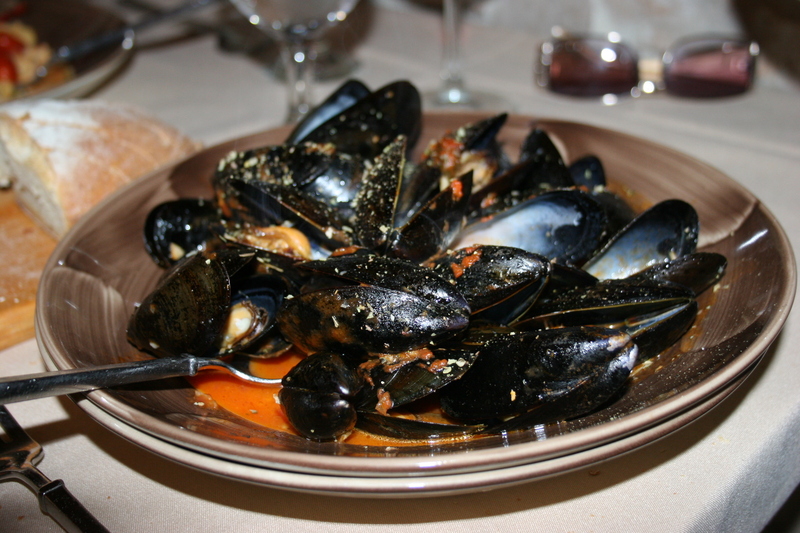 Kathy can seldom pass up a dish of mussels and tonight was no different as she chose the Cozzi Saporite, mussels steamed open in a tomato broth with garlic, oregano, parsley and an ample amount of white wine. Kathy seemed a little surprised when the sauce appeared more red than white but that did little to hamper her enjoyment of her appetizer. I didn’t have a whole lot of trouble in deciding on my starter and boldly ordered the Salsiccia ai Ferri, pork, parsley and sweet provolone sausage, grilled and served over polenta and sauteed beans with goat cheese dressing. It was good. 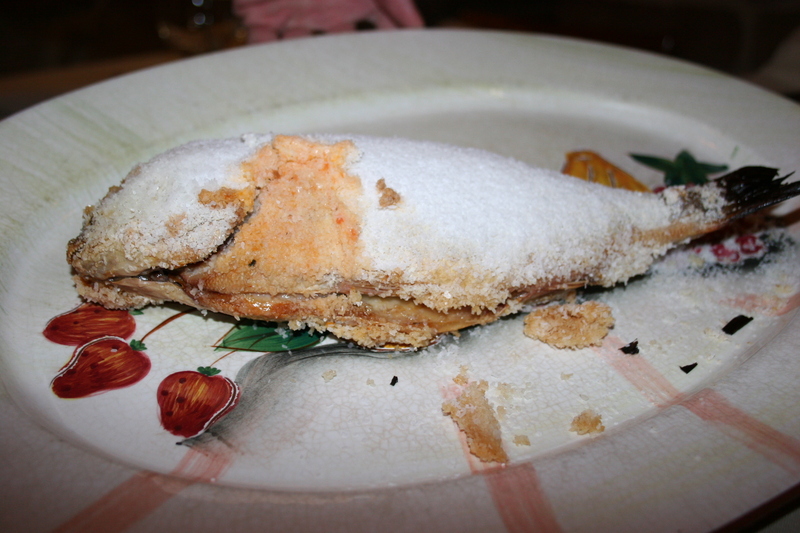 I felt like I was at a villa in Tuscany eating something truly native to Italy. It could have been the best appetizer of the night except for two things. 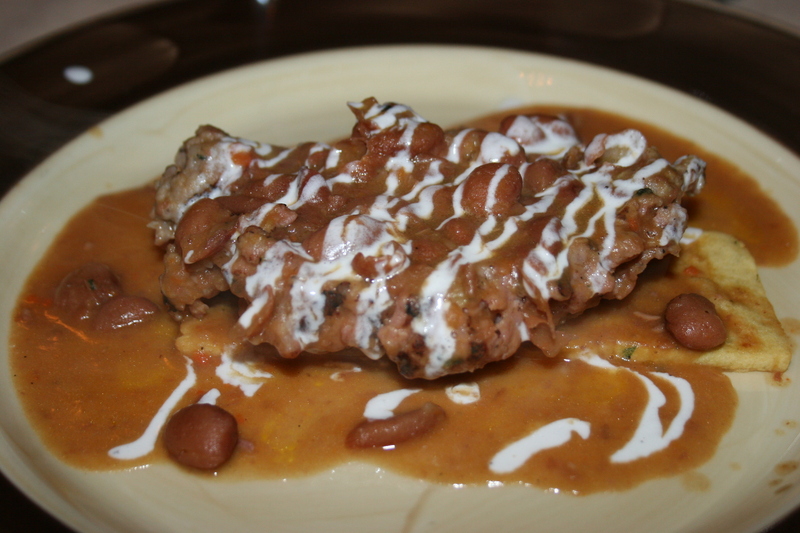 The first was the appetizer that Joe ordered, which was from the specials of the evening. 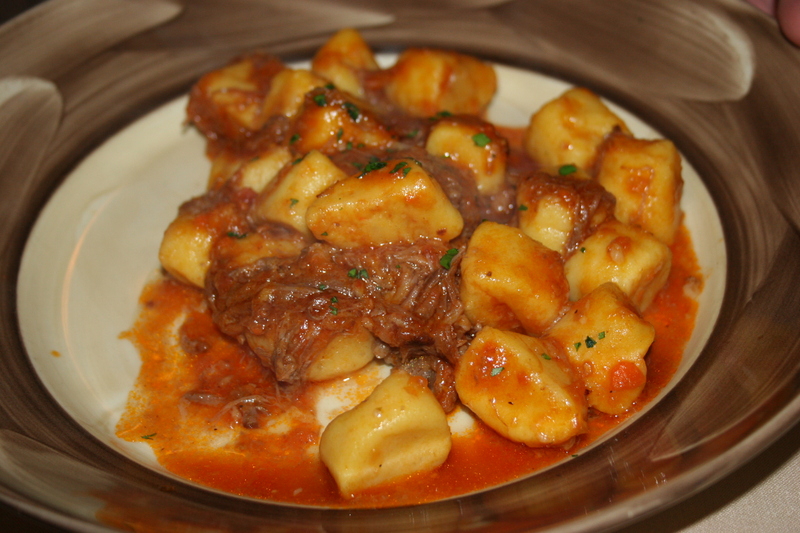 Joe ordered the Hand-made Gnocchi stuffed with butter-nut squash and served with Oxtail ragu. Joe offered me a sample and it was scrumptious. Joe thought it was among the best “tail” he had ever had(sorry, I couldn’t pass that up). This would have made an excellent entree with just a slightly larger portion. As good as mine was, as better as Joe’s was, Carol’s was the best of all! 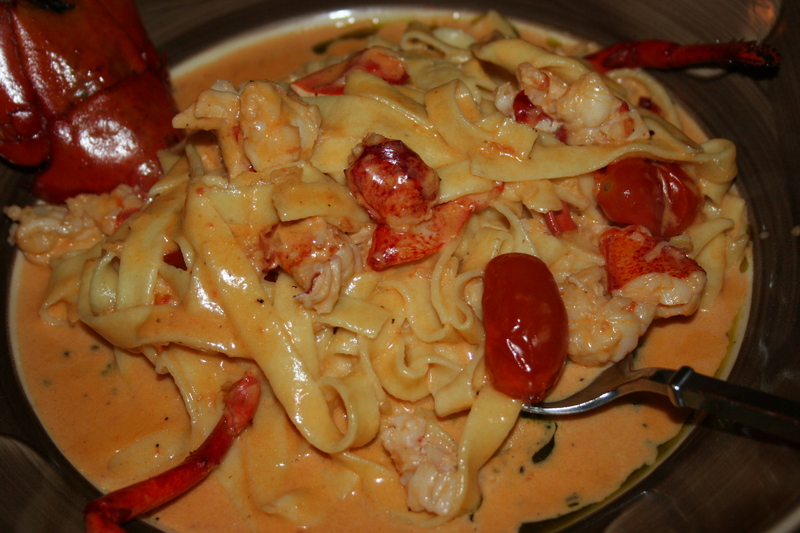 She had the Fettucine al Ragu d’Astice, Maine lobster meat sauteed with shallots and cherry tomatoes in a white wine tomato, touch of cream sauce with fettucine served over a layer of pesto. This was actually an entree selection which, like many of the items on the Sapori menu, can be ordered as an appetizer. This one was exceptionally good. We could have left Sapori at this point quite content and pleased with our meal but we would have missed the entrees. 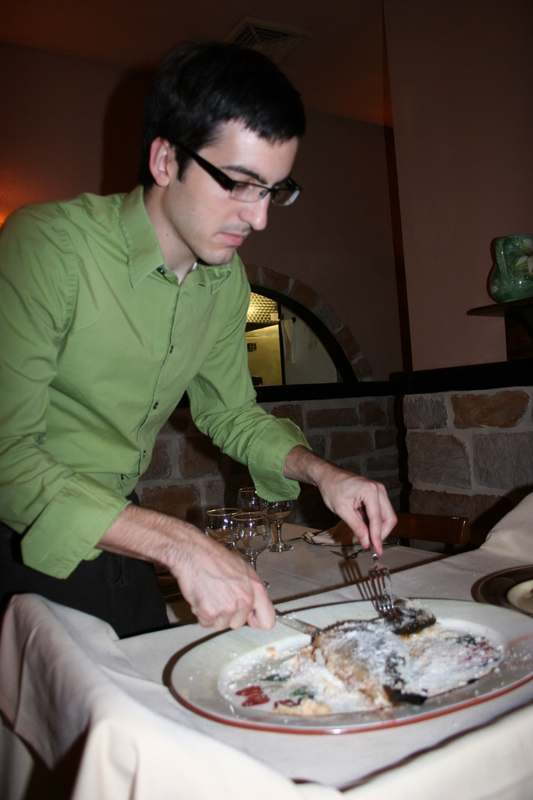 Joe stayed with the “specials” and opted for the “fish of the day”, a Grilled Sea Bass, fileted tableside. This creature of the sea was seasoned with sea salt and stuffed with butternut squash and served with a salad and some unknown dressing. Joe thought the flaky white fish had lots of flavor and he had no complaints about his selection. 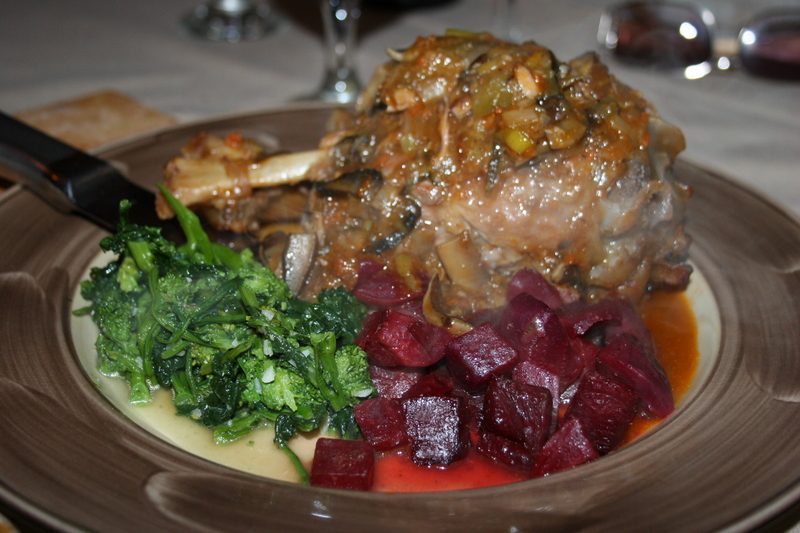 Kathy was tempted by Nick’s powerful description of another evening special, the lamb shank. After he assured her it would fall off the bone it got her vote and came to the table with side servings of both beets and broccoli rabe. The lamb was tender and flavorful and Kathy was pleased with her choice. 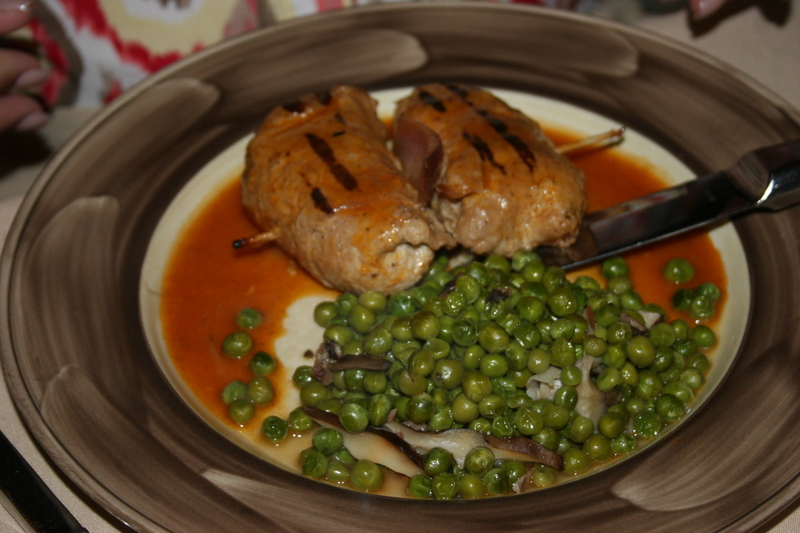 Carol was set on some type of veal dish but wasn’t sure she wanted the accompanying sweet peas. Once again, Nick used his power of persuasion by hinting that not only were these the best tasting peas ever made but, he would be willing to exchange them for another veggie if she didn’t agree. Hey, not even your local Ford dealer will give you a guarantee like that so Carol selected the Spiedini di Vitello, tender filets of veal rolled with pine nuts, raisins, bread crumbs, pancetta, onion and caciocavello cheese, grilled and served with onion and bay leaf, topped with a lemon-olive-oil-almond butter sauce, with a side of sweet peas. Whew, that is easily the longest, most involved set of ingredients in any entree I have ever written about. You would think they needed three plates to serve all that but there it was resting nicely on a single plate. 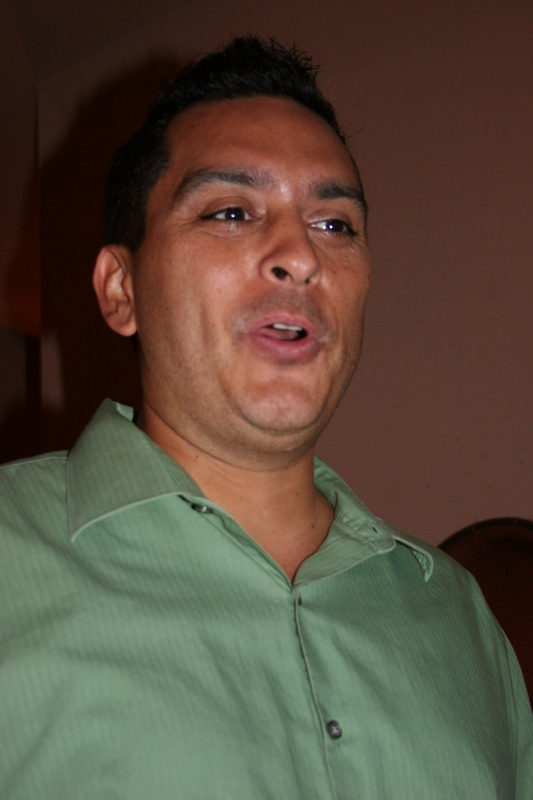 For you pea lovers out there, don’t be conned by Nick’s passionate plea for the joy of peas. Carol felt they were still just peas and just passable peas at that. She did like her veal choice very much and that’s what counts. After being assured by “you know who” that the chicken thigh I was about to order was “boneless” I settled on the Braciola di Pollo, all natural chicken thigh stuffed with butternut squash (thinking it must have been on special at a local produce stand this week), provolone, sage and scallions and baked in a lemon zest-sage butter sauce and served with spinach and potatoes. It was a nice change of pace to be served thigh meat instead of the breast which is usually standard at most restaurants. My meal was excellent. 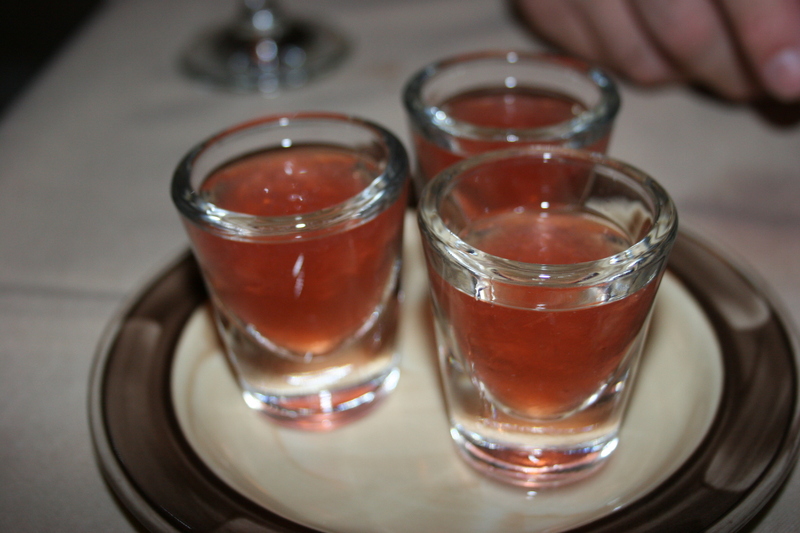 We passed on dessert but three of us gave a thumbs up when offered a strawberry flavored “lemoncello” ( I know that doesn’t make sense but, you know what I mean). It was the perfect topper on an excellent meal. 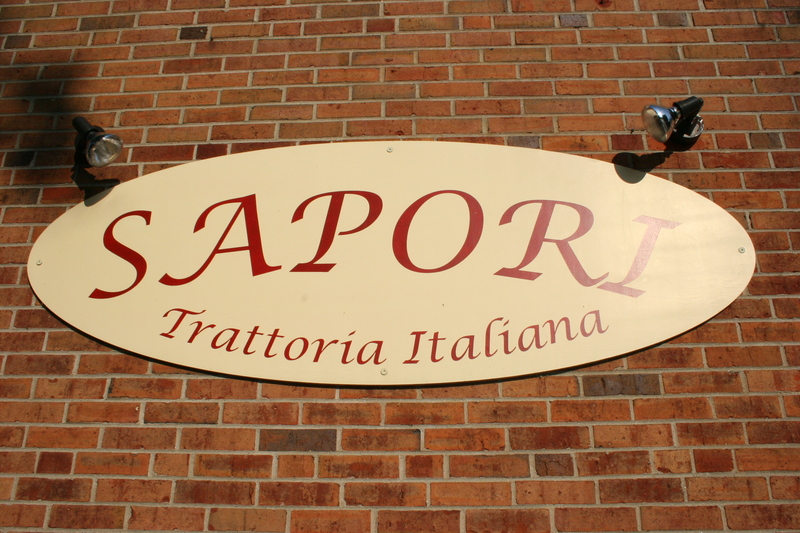 Sapori, on Haddon Avenue in the heart of the BYOB capital of New Jersey (Collingswood), certainly has earned another visit in the not too distant future.